Almost 1 in 5 working Australians are aged over 55. Given that the average age of intended retirement is currently 65 years, this suggests that a significant number of people considering their transition out of the workforce. For many this is 'unchartered territory' and they are asking questions such as 'how should I be spending my time' and 'am I really ready to retire yet'? Has your organisation stopped to consider how best to support this cohort of staff or members? The ability of any organisation to deliver high quality services is dependent on its people. The challenge for Australian organisations is that the workforce is ageing and that means that we need to think differently about how we attract, engage and retain our staff. If almost 1 in 5 working Australians are aged over 55 and the intended retirement is currently 65 years, it suggests that a mass exodus could occur in the next ten years. If this retirement intent does eventuate, the loss of knowledge, experience and expertise would be substantial. Could your organisation afford this loss? Organisations therefore need to look at how they can attract and retain these mature workers and harness the skills, motivation and experience for best business outcomes. As such a structured, strategic approach to management of an age-diverse workforce is required. Like to know how? Download the Strategic Management of an Ageing Workforce Information Sheet below. It may or may not come as a surprise to you but not everyone approaching the age of retirement is actually planning to retire in the true sense of the word. 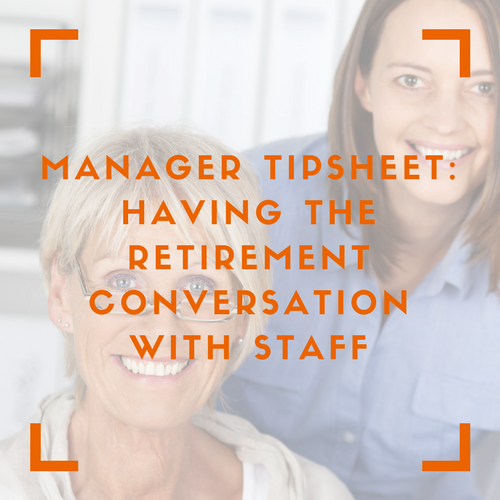 Without a doubt there are for whom retirement can’t come soon enough, but there is an equal portion who want to keep working in some capacity. In fact, 13% of Australians aged over 45 said they intend to never retire! Is the management of an ageing workforce on your agenda? Those who want to stay active in the workplace and on the whole are healthy and motivated. The stereotypes that they are ‘past it’ and unable to adapt to new technology are not valid. As such they are valuable assets to any organisation. We therefore need to think differently about how we engage and support our mature workers and harness their skills, motivation and experience for best business outcomes. The good news is that it’s not actually that difficult. Whatever initiatives you introduce to support mature workers can only benefit all, yourself included! Think of it this way, rather than thinking about mature worker support, create age-inclusive strategies. Diversity (including age) is invaluable to an organisation as it encourages innovation and a positive workplace culture, thus helping organisations to be at the forefront of their industry. Robust financial planning is critical for positioning oneself for greatest flexibility in deciding how and when to retire, but what about the other factors that contribute to a fulfilling and enjoyable retirement? Social connection, health & well-being and relationship dynamics. People approaching the retirement age today are typically healthy, active and still want to make a difference to the community around them. They are pondering the ‘what’s next’. Some can't wait to retire while others want to keep working and continue to contribute. Either way, investing in a Retirement Transition Workshop and enabling participants to explore the non-financial aspects of retirement is a great way for organisations to value their staff or members.